If you have ever been to a doctor’s office or a learning center you will most often see that they have an activity center and with good reason. Kids love them. They are a great challenge and provide lots of different activities all in one center. It allows them to be creative, learn, and play all at the same time. They are easy to find, but what ones are the best? It is essential that you a list of the Best Activity Cubes and why they are the best. Simply pick one below, buy, and watch the smiles appear. Activity cubes are all-in-one toys that offer a wide range of activities that introduce many different concepts to your child. You can be assured that our list of the 15 best offers a vast array of styles and sizes that provide hours of stimulation. In addition, product specifications, cost and availability have been reviewed and verified as accurate. 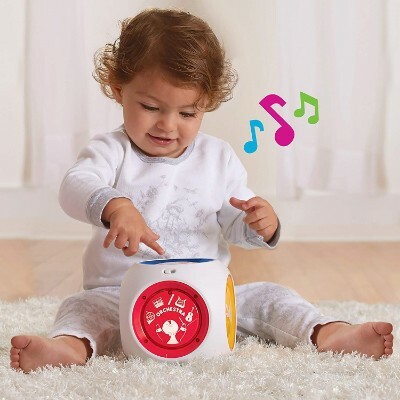 The Munchkin Mozart Magic Cube is the perfect activity to keep little fingers busy while stimulating their imagination through the power of music. 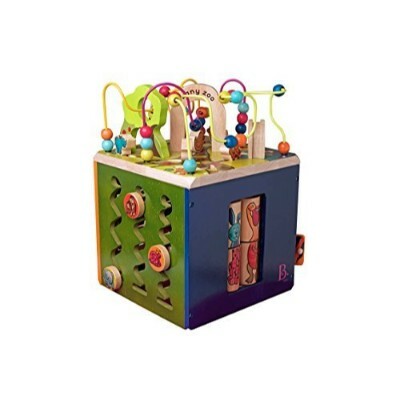 This delightful cube features large, brightly colored buttons decorated with an individual instrument. When pressed, each of the buttons will begin to play one of eight Mozart songs. Press the violin button and watch your baby’s eyes light up with excitement as Twinkle Twinkle Little Star begins to play. Press the piano button and the song becomes a duet. Press the orchestra button and listen as a whole concert starts in your living room. 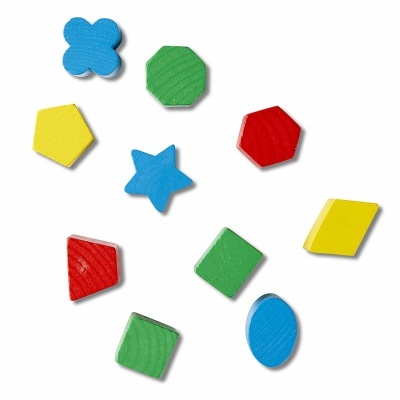 The large buttons are ideal for encouraging gross- and fine-motor-skill development. Bright lights flash in tempo as your little composer adds more and more sounds, strengthening their cause/effect relationship understanding and stimulating cognitive growth. Many babies are drawn to music though science still doesn’t completely understand why. It may have to do with what they are able to hear from inside the womb before they are born. Music may even replicate some of the comforts of their previous home, it’s difficult to say. What is easy to see is the smile on your little one’s face when they hear or interact with music. 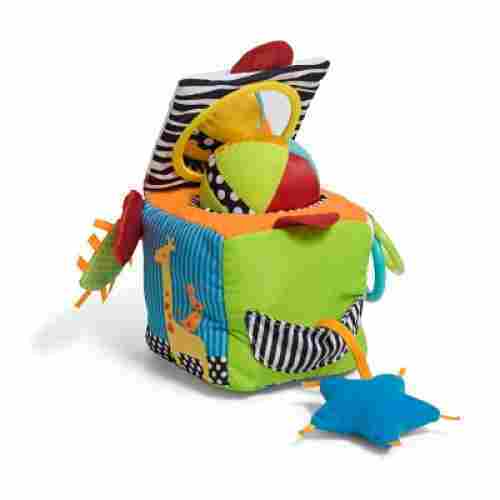 This activity cube is ideal for children between the ages of six months and three years. 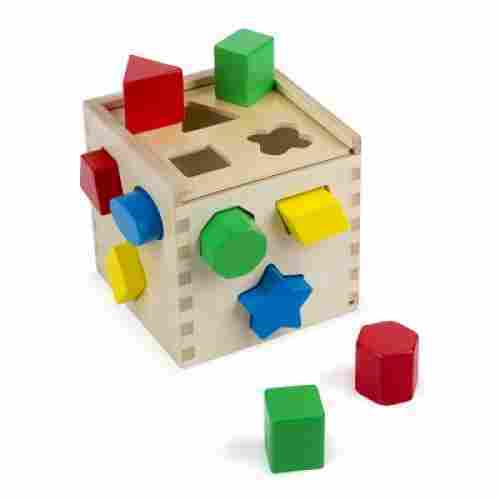 Develop the capabilities of your baby with this five in one learning activity cube. The cube has been designed to provide children with a safe enriching experience. The sides have been smoothed out, all of the paints are water based and are non-toxic, and the cube has been created out of materials that are of the best quality you can find. Putting a smile on their face will never be as easy as it is with this activity cube. 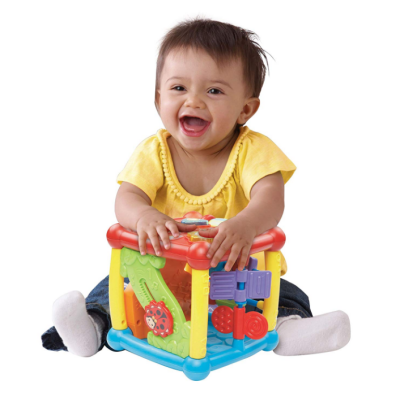 There are bright colors and sensory stimulating gears that improve the cognitive development of your little one. On top of the cube they will find a maze created with beads then moving to the side of the cube there are sliding bugs that encourage their fine motor skills. Then there is a side with shapes that fit into cutouts on along with a clock with moving hands on the next side. All of these activities are great for keeping them busy for countless hours while developing their developmental skills that are vital to their coordination and mind. 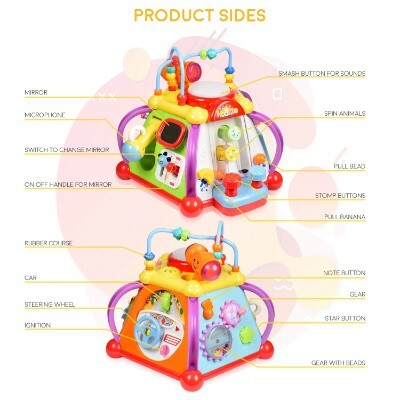 Gadgets on this cube have been created to give babies between the ages of two and six a full sensory experience. It is able to stimulate their minds and bodies while providing a learning experience that is safe and effective. If you are looking for something a little different, a little more unique, then the B. Zany might be the right fit for you. This beautiful wooden activity cube is almost more an art piece than children’s toy. Each of the four outward faces as well as the top feature a different activity designed to entertain and stimulate your child. The alphabet gets its first introduction with individual spinning tiles that are adorably illustrated with brightly colored images that depict an animal or activity related to each letter. Large, round, child-friendly circles wait to zig-zag down another side while yet another face houses spinners that can create silly animal combinations. This cube even has an entire face dedicated to opening and closing doors to play peek-a-boo with the little animal and alphabet friends inside. This activity cube is win-win-win-win-win! Manipulating the small shape spinners, moving and spinning tiles and beads is perfect for strengthening fine-motor skills and building hand-eye coordination. The cube reinforces and introduces early language concepts with repeated uses of the alphabet and corresponding imagery. This can help your child began to understand the concepts of speech and stimulates cognitive growth. This cube was designed specifically for children between 1 and 3 years of age and it's easy to see that the lead designer did his or her homework. 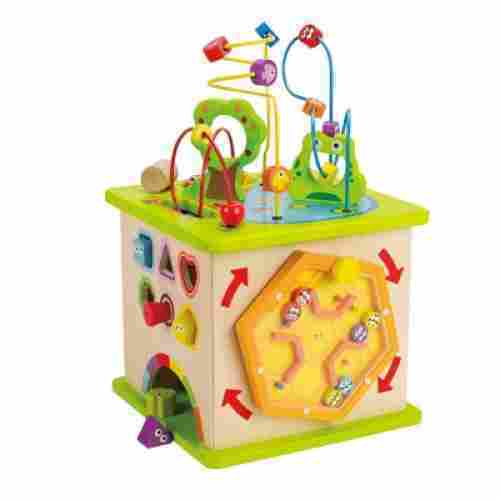 This durable and sturdy activity cube features many different developmentally stimulating play options. 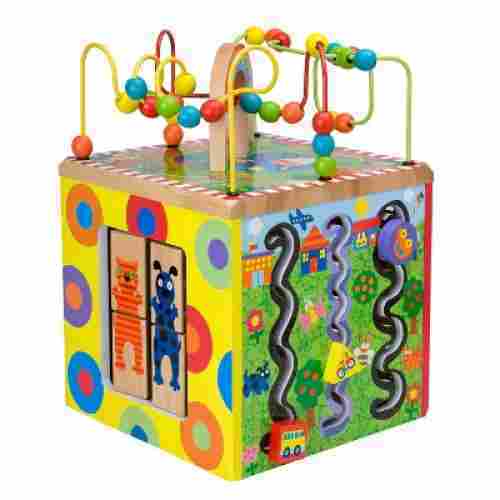 Early and pre-walkers can use the cube itself to pull themselves to their feet with little fear of it toppling over, then find themselves enamored with the wooden bead roller coaster that awaits them once standing. This cube is a super fun way for your child to remain engaged but not bored. 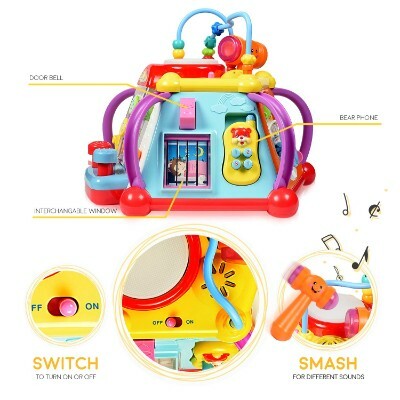 With so many different sides of interactive musical options such as a steering wheel and pressable buttons, your child will be feeling like a singing’ mad scientist in no time. The WolVol Musical Activity Cube Play Center is not your ordinary cubical activity block in the strictest sense since it takes on a pentagon-shaped pyramid with a wider base than its flat top. Nevertheless, the design of the WolVol Play Center gives young children the opportunity to play with 15 different activities that range from simulating driving, playing with a variety of tools, answering a cellphone, pretending to be in slumber land, and even singing their hearts out like a superstar on a concert tour. With so many buttons to tinker with, plenty of switches to flip or slide, and even rollers and beads to fiddle with, the WolVol Play Center can be a smorgasbord of excellent sensorimotor learning for young children. It even comes with features that light up to provide enough visual stimulation to the developing brain. Adding to the light effects are wonderful sounds that help meld all the sensory information together. 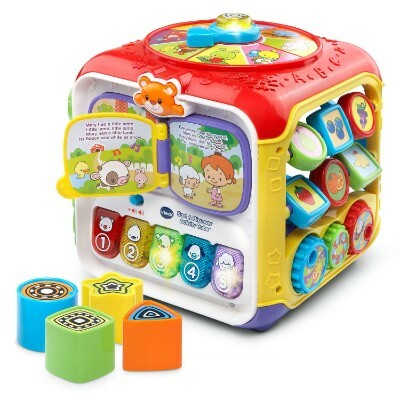 Loaded with fun and educational features, this cube is perfect for children between the ages of 18 months and 6 years. Some reviews state this product does not stand sturdy. It may not be suitable for babies who are pulling themselves up and learning to stand. If you don’t like plastic toys for your kids, maybe one made out of wood would be more ideal. 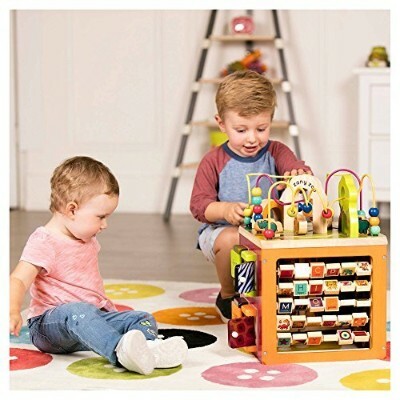 The Busy Town Wooden Activity Cube is the perfect traditional learning cube for a child who can be easily overwhelmed with many moving parts and noises. The cube is much simpler than some of the other plastic-based ones, but is safe because of its wooden construction and can easily entertain side-by-side, without throwing your child into sensory overload. Colorful beads can be slid through the maze of poles providing visual and tactile stimulation. The beads themselves are instrumental in the development of color recognition. Also included are pictures of animals which children get to spin and match, helping with convergent thinking and problem solving skills. The peek-a-boo doors are lovely, featuring some of the neighborhood’s most recognizable people – when it comes to cementing the idea of object permanence among older babies. Alphabet tiles can be turned to provide kids with a unique opportunity to learn the basics of ABCs. Providing fun while enhancing motor development ate racing rollers. Children ages one through six can enjoy all the fun features of this cube. The Infantino Big Top is perfect for babies, thanks to its soft and plush design and the integration of simple yet very useful learning activities to stimulate very young minds. 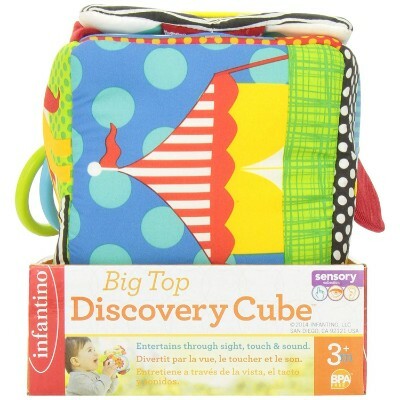 If you’re concerned about the safety of your baby, nothing can be safer than the Infantino Big Top Discovery Cube Development Toy. This cube toy is made of super-soft yet baby-friendly materials so it offers your baby a uniquely soft tactile experience. Each side of the Big Top comes with a variety of simple toys intended primarily for babies such as a clacker ring and even a peek-a-boo mirror underneath the lid. The Big Top is just perfect for babies as the different textured patterns and high contrast color patterns allow for optimum sensory development. The colors on the different elements can stimulate brain development while the soft texture allows for the development of fine motor capabilities. The Big Top is ideal for playing put and take to help facilitate the continuing development of your baby’s other skills. This toy, made of soft materials, is designed for your infant. It is perfect for providing your baby with a snuggable and educational toy. It features a variety of textures for little hands to explore. This toy features a mirror perfect for aiding your little one one the journey to self discovery. This sweet little cube provides your baby with a complete multi sensory experience. This product may be over stimulating. 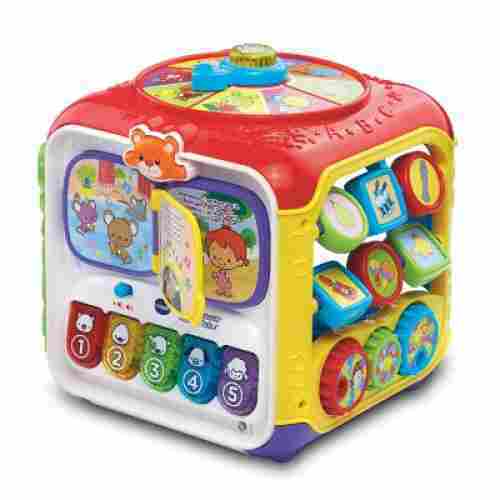 This VTech cube is perfect for the musical family who loves to teach their kids through tunes. The five-sided cube has songs and melodies that are perfect to sing your child into an educational wonderland full of vocabulary, shapes, animals and more. The sensory inputs provided by these learning activities can help in the enhancement of babies’ cognitive development. 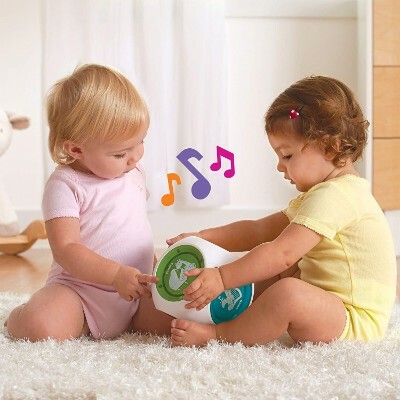 On the auditory side of things, babies are treated to a fantastic array of beautiful children’s songs, melodies, tunes, sounds, and even phrases to help them begin building on their vocabulary, speech, language, and communication. On the visual aspect, kids are given colors, lights, shapes, animals, and a whole lot more. The Sort and Discover is not only good for children’s sensory development; it is also superb in developing their fine motor control. Flipping the pages of the plastic book, pressing on piano buttons, and twirling on the spinners all require motor input which, in turn, produces the different sensory stimulus that will help complete the sensorimotor development of older babies. For toddlers, the shape sorter feature, alphabet, numbers, and colors can also help enhance their problem-solving skills. Truly, the VTech Sort and Discover is a marvelous young kids activity cube. By the age of 9 months, most babies will already be able to sit on their own without support. Some more adventurous babies will already be attempting to pull themselves up to stand. This makes the VTech Sort and Discover Activity Cube a very ideal cube toy as it provides young tots with all the right kinds of mental stimulation they need to develop their cognitive processes. Introducing colors and shapes at an early age is proven to aid in the development of early literacy. Developing the skills that they need to promote their cognitive development aids in the development of the connections needed to be able to learn, read, and write at an early age. The cube features the five sides and 14 different types of manipulation hand and finger features. These features are able to develop their sense and also encourage them to learn through play activities. There is something to explore on every side of this cube. 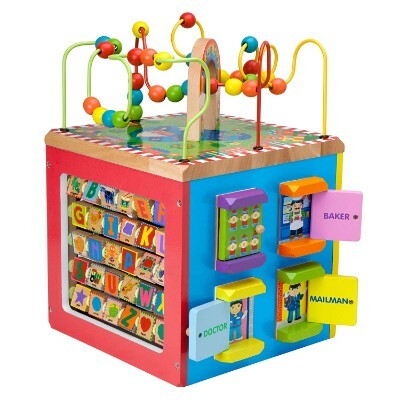 It has light up features with buttons, music that plays, displays primary colors, and so much more. The shape buttons aid in developing their ability to identify their shapes and the animal characters help with animal name recognition. There is an even musical instrument on the one side that introduces their different names and sounds. On another side of the activity cube, they will find blocks that slide and spin. This provides them with the experience needed to develop fine motor skills. The cube even plays sounds when it is moved around. 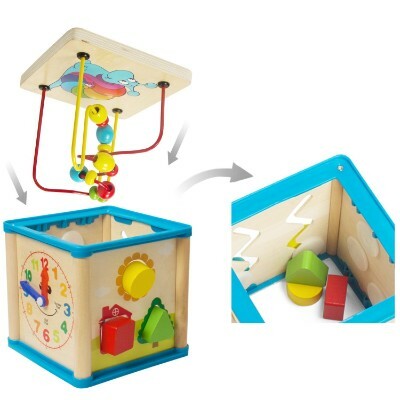 With the lights, sounds, shapes, musical instruments, songs, and so much more this activity cube will keep your baby busy and learning. Babies are learning every minute that they are awake and each of those minutes is crucial to their development. 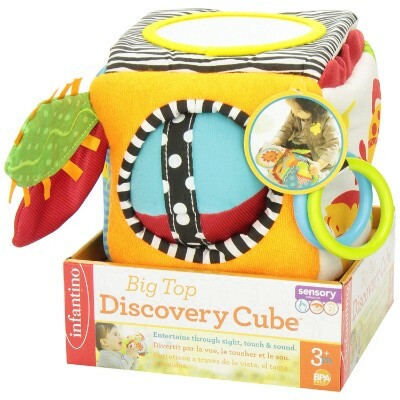 Providing them with toys like this busy learning activity cube with five different sides of discovery will aid in that development. 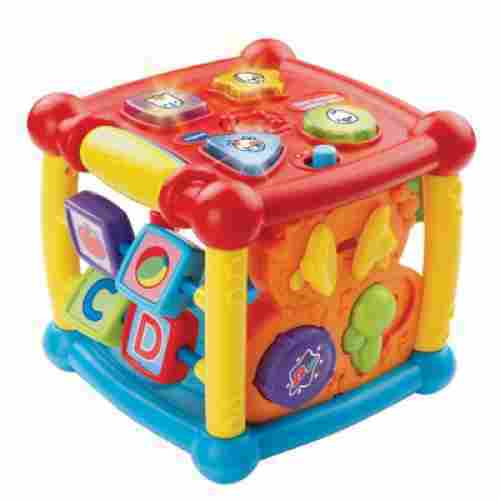 Your child should be at least twelve months old to play with this cube. Not all cubes come with bells and whistles or in our case lights and sounds. Melissa & Doug’s Shape Sorting Cube is perfect for kids who tend to get overwhelmed when there is too much going on with a toy. The cube is also made completely out of wood, which makes it eco-friendly and safe for younger ages. It’s built to last and won’t be something you’ll need to worry about like other cubes with small parts and many different options on each side. The idea is simple; the blocks just need to be matched up to their correct shape and put through their corresponding hole -- That’s it! Getting a feel for each shape will teach your child about symmetry basics as well as getting a feel for specific shapes, while the vibrant colors will help them to remember which shapes go where. After just a few days of matching the blocks to their counterpart spaces, your child will be improving their memory and sensory skills as they match each shape like a pro. It’s great for kids younger than toddlers because there are no small parts and it’s simple enough that there won’t be any extra added stress trying to figure the cube out. This cute little cube is another eco-friendly wooden construction option that invites your child to be fully immersed in playtime. Hape’s Country Critters features an array of different animals that come in bright and cheerful designs that will encourage kids to have fun. 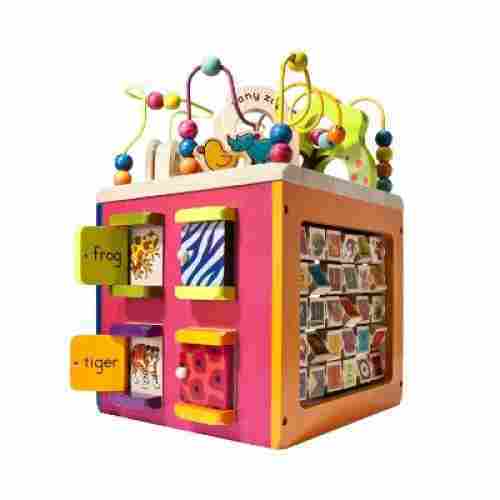 The wooden activity block features a variety of learning activities that enable children to learn shapes and colors while also introducing them to the names of different animals that are commonly found in the neighborhood. While the Country Critters excels in sensory development, it never fails to address the need for optimum motor development as well. There are shape sorters, sliders, mazes, and spinners which can all be beneficial in developing the motor skills of children. Children as young as one and as old as six can enjoy playtime with these adorable critters. he materials used in developing these products are safe and non-toxic. They are eco-friendly and provide your baby with the best and safest educational toy. These products are also durable and built to last. This should, not only give your child the opportunity to get more playtime out of these toys but also give you the most bang for your buck. You can have peace of mind knowing your child isn't being exposed to harsh chemicals and will love all the benefits these toys have to offer. 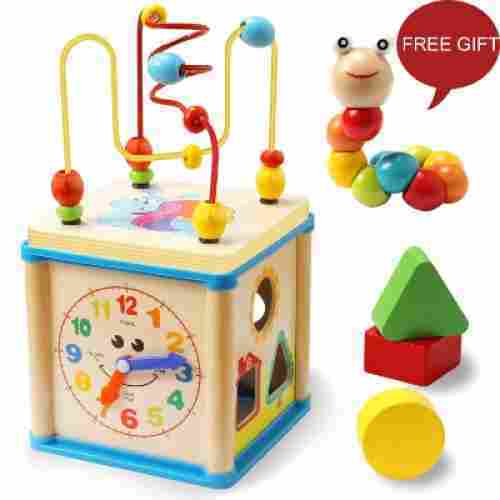 Your child will thrive from exposure to all the lessons offered by these multi purpose toys. 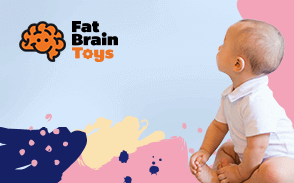 If healthy brain function and development is of the utmost importance to you, you can be assured these toys are designed to focus one enhancing skills necessary to a happy healthy future. These educational toys offer exposure to numbers and letters introducing your little one to the basic fundamentals of math and language. 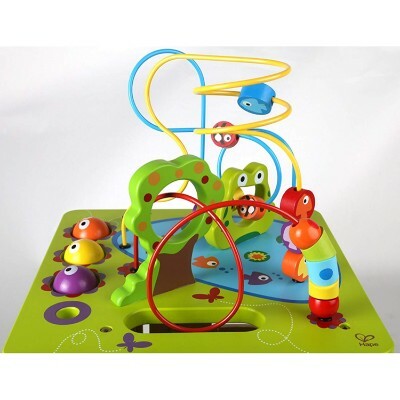 The interactive nature of these toys will inspire your little one to stand and even crawl. This will aide in the development of gross motor skills and building core muscles necessary for healthy body and muscle development. These cubes are also designed to nurture the development of fine motor skills. The development of these skills not only help with muscle function but also begin stimulating the neuron pathways in the brain. This stimulates recognition and memory as well as cognitive and visual abilities. The cubes offer multi-purpose surfaces that provide a number of engaging activities that nurture sensory development. The design of these cubes feature colorful aesthetically pleasing shapes and patterns that are meant to enthrall your baby and promote focus. Animal recognition is introduced as well. There are a range of cubes suited for infants and toddlers, the age recommendation for some are supported up to 6 years of age. 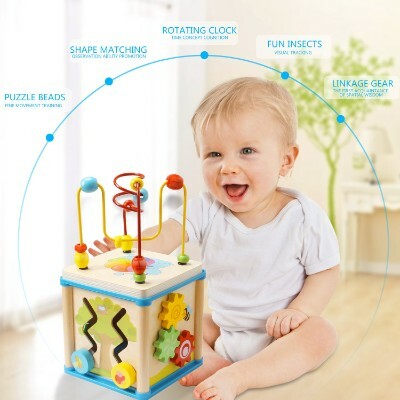 The interactive intention of these toys will provide your baby with several stimulating objects to explore. There are some one this list that play songs and melodies and others that light up. As we all know, it can be hard to keep a child’s attention. They are always one to the next thing and it can be a challenge to settle them and focus their attention. These toys offer so many different properties for your little one to explore, it is designed to keep them engaged no matter how much their attention may wander. There are a few options one this list that offer the same educational benefits with a less busy delivery. Those selections are great for children with learning disorders or hypersensitivity as too much going one can cause your child to become overwhelmed or more easily distracted. These versatile products can be used a fun and educational toy as well as a tool for helping your baby to relax and refocus their energy. In determining if the cube was appropriate for the target age range we decided the cube must be easy to use, safe, and hitting the developmental milestones. We wanted the features of each cube to be entertaining but also easy to enjoy. For instance, the buttons should be easy to push and everything should be easy to grasp by tiny hands. Additionally, product safety was a paramount concern. Since our intended users of these items are young kids below the age of 3, it was imperative that we ascertain the safety profile of each product. This meant looking at any certification that would point to the use of only the safest materials in the manufacture of the product. Moreover, it was also crucial that we look at the design integrity of the item. We don’t want any component that can be easily detached which young children may inadvertently put in their mouths and risk choking or suffocation. Activity cubes can make great travel toys as they can sit in your child's lap and entertain them. Cleaning plastic activity cubes is stress free as they can be wiped clean. Plastic cubes are ideal for classrooms or in locations where multiple children will be enjoying them. It doesn’t really matter whether you are going to buy a simple activity cube or one that fully integrates a variety of sensorimotor experiences. The crucial point to understand is that babies and toddlers require ample sensory stimulation to facilitate optimum growth and development. Whether it is the benefits of shape sorters or the advantages of musical toys, integrating all of these elements in one complete package can be a very interesting prospect in early childhood development. It is for this very reason that playing with activity cubes can be very beneficial for infants and toddlers. Here’s why. It helps them master a variety of their motor-related skills including fine-motor capabilities, spatial reasoning, and visual-motor coordination. These provide the foundation for more complex motor tasks such as writing and holding a variety of tools and equipment as kids grow older. These toys help young kids develop their communication skills by building on their vocabulary and the use of certain phrases. Equally important is the correct pronunciation of words which serves as one of the fundamental backbones of speech. Activity blocks enhance the establishment of neural connections, ensuring that cognitive processes such as memory, convergent thinking, and simple problem-solving are laid down as essential building blocks for more sophisticated and more complex cognitive processes like critical thinking, logical reasoning, and divergent problem-solving. These toys can help provide an outlet for the expression of infant and toddler anxieties. By keeping them busy and focused on what they are doing, the mind will not be led astray thinking about anxiety-provoking things. This helps them feel more relaxed and, in turn, become happier babies and tots. q: Where are these toys made? There are a few that are manufactured in the US, most however are made in China. q: Are there other languages? These toys only feature exposure to the English language and alphabet. There are some related toys that offer other languages. q: Are they made of safe materials? There are a few cubes that are miniature so they weigh much less than others. But the majority do weigh quite a bit in relativity to your child’s weight. q: Can these toys be used with other blocks? The shape and size of these cubes do support the possibility of using blocks from other sets. (a review stated one set of blocks has really sharp corners) However not all of these sets have blocks included or do not support the need or space for blocks. q: What’s the earliest age I can give this to my child? Most activity cubes are made for children three years and older. Unless they have small parts, you can encourage them to play with cubes at a younger age but some parental supervision may be necessary, at least initially. Any cubes with small parts that may fall out or get eaten should be restricted to toddler-aged children or older. q: Which is better, a wooden activity cube or a plastic activity cube? Neither cube is better than the other. The type of activity cube your child will enjoy depends on what you’re looking for; wooden cubes will be eco-friendly, simple in concept, and not overwhelming, while plastic-based cubes often have more parts, have a musical or noise-related aspect, and may have lights and other sensory parts. q: Are there loose pieces? As mentioned above, there is a few options on this list that have blocks included in the set. With the exception of those toys, all the other cubes one this list come with the pieces fully mounted and put into place to prevent the threat of choking.